This CD, released in 1997, is made with the London Symphony Orchestra (except tracks 12,13,14), and includes the hit single Time to say goodbye, which Sarah made together with Andrea Bocelli. 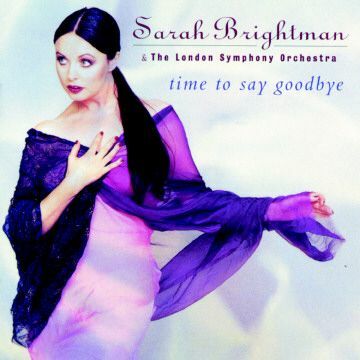 US-version: "Time to say goodbye"
This CD has been released in the USA under the title Time to say goodbye, with the same songs in a different order: first comes the song Time to say goodbye, then the remainder. The CD cover (26kb) looks the same, but for the new title. Someone wrote me that the songs No one like you and Tu quires volver are slightly different. Another person told me that the last stanza or No one like you is different: clearer to hear than on the European version (maybe Sarah had to sing this part anew for the US version?). The CD is released by Eastwest Records GmbH in 1997, no. 0630-19181-2. The CD booklet unfortunately contains only the lyrics of the 2nd song. I found the lyrics of the 12th song somewhere on Internet and received the lyrics of the other songs from visitors of these pages [many thanks!!]. And I have also received (literal, rough) English translations of the non-English lyrics [many, many thanks!!]. If you have additions and/or corrections, please let me know. Note that song number 6 ("Bilitis gènèrique") does not have words, only "la-la-la" and such. It took some time to get used to the songs on Timeless, I have to admit, but after hearing it several times I can say that the CD pleases me, even though some of the songs are a bit too opera-like for my taste. Sarah's wonderful voice can be heard clearly in every song, since it is never drowned by music (as is the case in most songs of Dive) and in that sense this CD does justice to Sarah's voice. Yet, for the kind of songs I prefer Sarah's CDs The songs that got away and Surrender, the unexpected songs. Unfortunately most of the songs on Timeless are in languages I do not understand at all, so I don't really know what the songs are about. There is a clear devision in the kind of songs on Timeless. The London Symphony Orchestra playes the music on the first 11 songs. Number twelve is a more popular and very different from the rest. The last two songs -- "encore tracks" as the CD calls them -- are again very different and definitively opera-like, and these two are my least favourite. 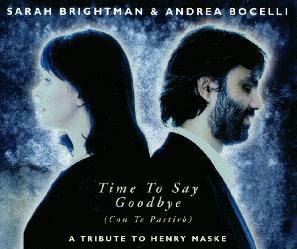 There was also a single called Time To Say Goodbye released in 1997. The cover of the CD-single says that it was "Recorded Oktober 1996 at Nemo Studio" and it is "A Tribute to Henry Maske"; see for info on what the latter remark means this article in The Independent. *) There is a song of this title on the CD "Fly" and I have linked to its lyrics; I am not sure whether it is the same song here, but I think it is because the re-released version of "Fly" also contains Time to say goodbye. In 2000 there was a special release in Germany of the a 2-CD box with as disc 1 the album Eden and on disc 2 this single plus the 'bonus track' Desert Rose.